Mike Whorf interview, part 1. Mike Whorf interview, part 2. 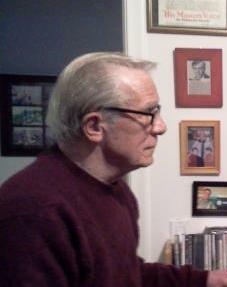 Mike Whorf is known to countless Michigan and mid-western radio listeners as the long-time Detroit radio host of "Kaleidoscope". The daily program which aired from the mid-1960s to the late 90s won the coveted Peabody Award in 1968, as well as numerous other honors. Starting in May, Mike Whorf's "Kaleidoscope" makes its return to Michigan audiences and listeners worldwide on WKAR AM-870 and WKAR.org. WKAR is partnering with Michigan State University's Vincent Voice Library in presenting MSU's 1000+ collection of Kaleidoscope programs donated by Whorf to MSU in the 1970s. Beginning Saturday, May 17th at 4 p.m. on AM-870, Mike Whorf's "Kaleidoscope" brings listeners an hour-long journey into the people, places and events that shaped our world today. In the first of a two-part conversation with son and WKAR radio station manager Peter Whorf, Mike Whorf recalled the origins of "Kaleidoscope". “Tempo” was the name of Whorf’s show at WTAG in Worcester, Massachusetts, combining his now familiar signature sound of narrative, interview, archival recordings and music. Today on Current State: a state budget update; children's spirituality and nature; Mike Whorf's "Kaleidoscope", part two; a review of "In the House Upon the Dirt Between the Lake and the Woods" by Matt Bell; and the Board of Water and Light's falcons. At the state capitol yesterday, Michigan’s latest set of revenue estimates were unveiled. It’s an important twice-a-year gathering with often serious implications for state government spending, budgets and taxes. Sometimes the literary world can suffer from a case of The Emperor’s New Clothes. We all know this story made famous by Hans Christian Andersen, of the ridiculous Emperor tricked into wearing nothing and the underlings around him too afraid to point out that he is only in his underwear. In the mind of the Emperor he is adorned in the greatest attire, but in reality there isn’t much left for the imagination. There are many expecting parents around Mid-Michigan, but few will produce offspring as rare as Eckert and Viper’s. The peregrine falcons are waiting for three little ones to hatch, after nesting at the Lansing Board of Water and Light’s Eckert electric generating plant.